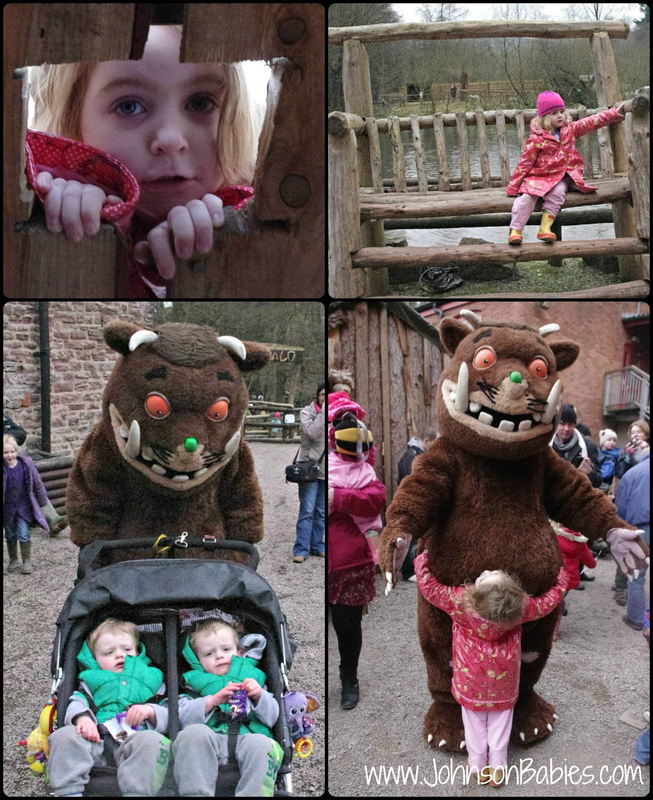 So, this Easter weekend, we've been on a bear hunt, an Easter egg hunt, so we decided to finish it off with a Gruffalo Hunt! The Dean Heritage Centre opened its Gruffalo's Child Woodland Trail this weekend, and we decided to make the most of my week off and go exploring. The Dean Heritage Centre is set in the Forest of Dean, we took the scenic route and a thoroughly enjoyed the drive for the fantastic scenery. On arrival it was busy! Talking to one of the team she reported this was the busiest day they had ever had. In spite of this the Centre had manned up with enough people to make car parking straightforward, and once you are in there is enough space and enough to do that it didn't feel at all overrun. We had a brief look around the main building, Squeaks was entralled by the artefacts, not quite understanding pottery yet. We went outside and enjoyed a picnic and then went off in pursuit of the Gruffalo's Child. The trail was fantastic, I took our Out 'n' About Nipper which is much more suitable for trail terrain, and was pleased that the double buggy managed the whole trail without problem. The children loved the trail. Meeting all the characters and reading the tale as we went. The trail is just long enough to keep little legs going. 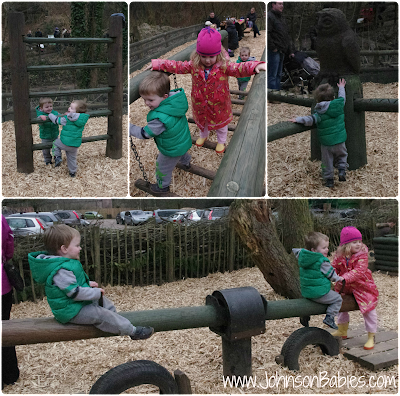 At the end of the trail was a fantastic adventure playground which managed to exhaust all three children. And left mummy letting them have "five minutes more" about ten times over. Time had to be called in order to meet the man himself. And it made their day. Each started off in complete fear and awe, which moved onto excitement and confidence grew. As always, we were badly timed, we didn't manage to do everything as the boys tired and needed their nap. I did notice the Dean Forest Railway on the way home which is hosting some 'Days out with Thomas'. This would make a fantastic day if we could fit both in next time! I've been on the Thomas Days, they are excellent but be aware of the timings of the different parts of the day because there's a lot of waiting around. Off to check out the Gruffalo trail on the Heritage Centre's website, The Boy would *love* that! Will definitely check out the timings- there's one in August so it's been decided I can go for my birthday! It really was a great way of getting the children involved one of their favourite stories. Oh this looks great fun and sounds like a day to remember! This looks SO good! I better not show my oldest, we're miles and miles away and I know I'll want to take him! Everyone loves the Gruffalo, looks like a great adventure with a full size Gruffalo too! Looking at your double buggy it looks just like my old one, we had it from the first children when welded a bike carrier on the front foot space when the triplets came along! Your "5 minutes more" took me back, so hard to take them away from some lovely outdoor fun! Looks like a lovely Easter break for you with lots of adventures. Thanks for sharing them all on Country Kids. What a great idea - this looks so much fun, my son would have loved it! My daughter loves the Gruffalo, we read it every night. A visit to see a full sized Gruffalo looks in order! Wonderful photographs. Popping over from Country Kids linky. Oh my boys would love that! Shame it's so far away from us :( Lovely photos of what looks like a lovely day out. 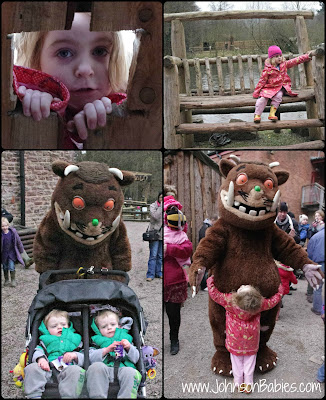 We are Gruffalo obsessed here so very jealous that you even met the great beast himself! Looks like a long weekend your way could be in order, especially if it involves trains too! 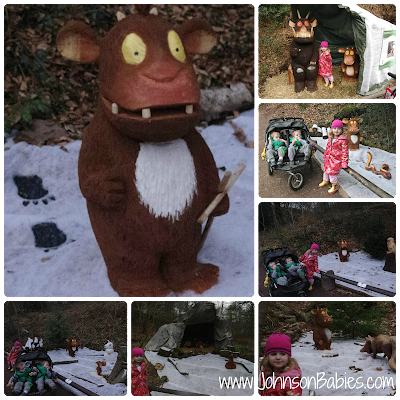 How exciting having a gruffalo trail! i think my wee man would probably be a bit wary of meeting the actual gruffalo though! Aw, my son would love that. Looks like you had a great day out.